VISIT NEW EX-TRAFIRE® WEBSITE. YOU CAN FIND ALL INFORMATION ABOUT NEXT GENERATION OF PLASMA CUTTING POWER SUPPLY. Thermacut now offers a suitable torch body for the Kaliburn® Spirit® and Proline® series of plasma cutting systems. Thermacut is excited to release suitable replacement VADURA® 9215 cutting tips used on the popular MESSER MS 932 with quick change system. Our unique design reaches 20% faster cutting speeds with a better kerf quality. 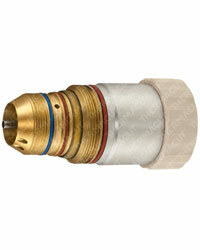 The nozzle has a unique design to achieve improved performance and is not interchangeable with competitors products. 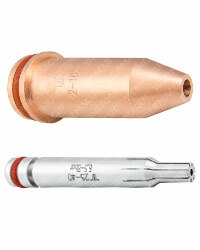 Thermacut has released a new nozzle holder suitable for newer TRUMPF® 2D Laser machines. The ceramic is made from high-grade raw material to ensure correct distance regulation and consistent focus positioning. 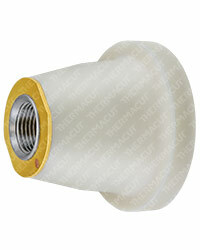 The Thermacut design is compatible with the OEM nozzle changer. Please contact your Thermacut subsidiaries for more information. THERMACUT®, THE CUTTING COMPANY®, FHT-EX®, EX-TRAFIRE®, EX-TRACK® A EX-TRABEAM® SÚ REGISTROVANÉ OCHRANNÉ ZNÁMKY SPOLOČNOSTI THERMACUT, K. S., KTORÉ SÚ ALEBO MÔŽU BYŤ REGISTROVANÉ V ČESKEJ REPUBLIKE ALEBO INÝCH ŠTÁTOCH. VŠETKY OSTATNÉ, TU UVEDENÉ OCHRANNÉ ZNÁMKY, SÚ VLASTNÍCTVOM ICH ZÁKONNÝCH VLASTNÍKOV. SPOLOČNOSŤ THERMACUT NIE JE V ŽIADNOM VZŤAHU SO SPOLOČNOSŤOU HYPERTHERM®, CEBORA®, KJELLBERG®, THERMAL DYNAMICS®, TRAFIMET®, AJAN®, DAIHEN®, KOMATSU®, SAF®, MIGATRONIC®, L-TEC®, HARRIS®, ESAB®, MESSER®, TRUMPF®, BYSTRONIC®, LVD®, MAZAK®, PRECITEC®, AMADA®, PRIMA POWER®, MITSUBISHI®, BALLIU™, GHT™, HACO®, FINN-POWER®, CR ELECTRONIC®, MESSER-GRIESHEIM®, ADIGE®, CINCINNATI®, KALIBURN®, WEIDMÜLLER®, OTC®. THERMACUT® využívá súbory Cookies pre prispôsobenie našich stránok. Umožňuje nám pochopiť, akým spôsobom využívate naše webové stránky. Súbory cookies sú malé dátové soubory, ktoré sú potrebné pre správnu funkciu stránok. Viac informácií o súborech Cookies nájdete tu. Kliknutím na tlačítko „Rozumiem“ alebo akýkoľvek odkaz mimo túto lištu súhlasíte s ich využívaním.